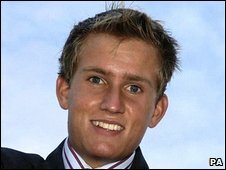 The youngest Briton to have climbed Mount Everest has been killed, along with a second British climber, in an accident in the French Alps. Rob Gauntlett, of Petworth, Sussex, reached the summit of Mount Everest when he was just 19 in 2006 and was highly regarded in the climbing world. His mother Nicola Gauntlett said the 21-year-old's family were "devastated". She said he and his as yet unnamed friend had been ice-climbing in Chamonix when there was a "big fall". Mrs Gauntlett said: "At the moment we don't know exactly what happened but there was obviously a big fall and they both died. We've only just been told the news." She said they arrived in the region on 2 January and were due back in the UK on Wednesday. Mrs Gauntlett added that she and her husband, David, would be travelling to France on Sunday. She went on: "We are all just devastated. He's far too young to die. We had spoken about something like this happening only recently. "We can only take consolation that he died doing something that he loved." Mrs Gauntlett said she was not prepared to disclose the identity of the second Briton who died. A Foreign Office spokeswoman said: "I can confirm that two British nationals were killed in an accident in the French Alps." She was unable to confirm reports that the pair had died in an avalanche. In November 2008 Mr Gauntlett and his friend James Hooper, of Somerset, were named National Geographic 2008 Adventurers of the Year at the society's base in Washington DC. The accolade was in recognition of a 22,000-mile journey using only human and natural power from the Magnetic North to the Magnetic South Poles to raise awareness of climate change. During the expedition between the Earth's magnetic poles, Mr Hooper and Mr Gauntlett skied, used dog-sleighs, sailed and cycled through Greenland, USA, Mexico, Guatemala, El Salvador, Honduras, Nicaragua, Costa Rica, Panama, Ecuador, Peru, Chile, and Argentina. The former pupils of Christ's Hospital in Horsham, West Sussex, then sailed to New York to begin the 11,000-mile cycle ride to Punta Arenas, Chile. After completing the trip from the North to the South Poles in April the pair sailed 1,800 nautical miles to Australia. Their expedition also helped to raise money for the Prince's Trust. In 2006 they became the youngest Britons to climb Everest.